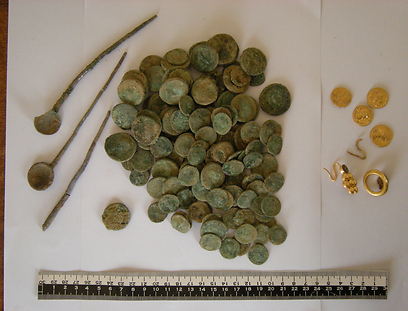 Worth its weight in gold: An impressive hoard of jewels, silver and gold coins from the Roman period was recently discovered at a rescue dig carried out by the Antiquities Authority in the Kiryat Gat area. The dig exposed the remnants of a structure from Roman and Byzantine times. When excavating near the structure's courtyard the archeologists noticed a pit that was dug out and refilled. To the archeologist's surprise, the pit revealed an incredible treasure wrapped in cloth – scraps of which still remained among the findings. According to the Archeologist Emil Aljam, the excavation manager on behalf of the Antiquities Authority, "The spectacular hoard includes gold jewelry, including a hand made earring with a floral pattern and a ring with a precious stone imprinted with a winged goddess, two silver sticks which may have been used in the application of makeup as well as 140 gold and silver coins. "The coins are from the era of Roman emperors Nero, Nerva and Trajan who ruled the Roman Empire between 54-117 AD. The coins have the emperors' portraits on them with descriptions of the emperor's religious rituals… gods from the mythology like Jupiter on his throne or Jupiter holding a lightning bolt." The hoard which was excavated through the funding of Y.S. Gat Ltd., the company that manages the Industrial Park in Kiryat Gat, was taken away from the site and was transferred to the care of Antiquity Authority labs in Jerusalem, later it will be put on display in one of Israel's museums. See all talkbacks "2,000 year old treasure found in Kiryat Gat"